It doesn't matter how much you work out or how healthy you may eat, if you're not feeding and exercising your spirit… you're going to feel run down and tired – you’ll run out of gas. You’ve got to do more than just take care of your body. You’ve got to energize your spirit! And the best way to do that is with God’s Word! That’s why we’ve put together this new interactive guide called Re-Energize Your Life! In this first-of-its-kind guide, created from Pastor Rick’s most practical teaching, you will learn everything you need to know to re-energize your life the way God intended. Step by step, you will begin a journey of restoration and renewal. It’s a hands-on guide you take at your own pace. No need to rush! In fact, we encourage you to stop and linger where you want to spend more time. You’ll benefit from biblical wisdom and learn how to apply it to your life in practical ways. This high quality “vegan-leather” bound, four-color interactive guide is a user-friendly, practical powerhouse! It’s eye-pleasing pages are packed with full-color devotionals, verses, and bible teachings that will dramatically impact your spiritual life forever. 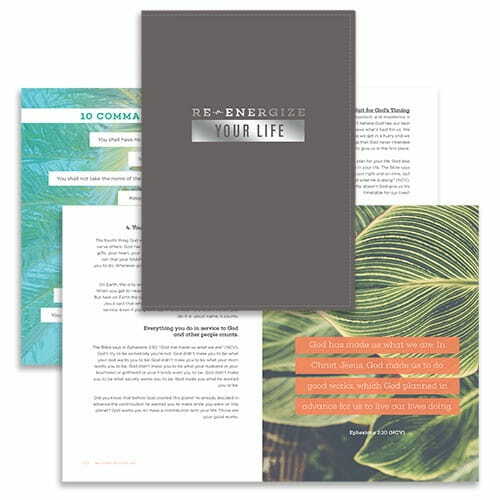 We’ll send you the “Re-Energize Your Life - A Life Change Book” when you give a gift to support Daily Hope. This is a limited time offer; request your copy today. Your generous support enables us to share the hope of Christ with people all around the world. Originally published October 08, 2016.